News!Site 6.0 Heads!Up Mobile Application Other Great Products! Rollout Strategy Great ROI Pricing Welcome! 1up! has been providing Internet solutions for online publishers since August 1998. 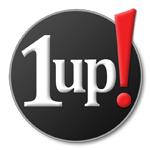 As a leading new media content management system (CMS) and online services provider for hundreds of community publications, 1up! also provides programming, advertising sales, production and infrastructure solutions for its customers. CEO and co-founder, J. David McChesney, worked at small newspaper and publishing companies for over 15 years as a photojournalist and editor. He served as a systems engineer and as corporate director of technology for the former Indiana-based Nixon Newspapers, where the idea of 1up! was born. This legacy of commitment to community publications is the foundation for 1up!’s success. Headquartered in beautiful Kokomo, Indiana, 1up! employs an experienced and sometimes ornery staff of 10. 1up!’s production services division, 72dpi, is located in Florida. From a technical perspective, 1up! 's network infrastructure is top-of-the-line. Redundancy and clustering is the name of the game to ensure the reliable delivery of your website. And everything is behind a state of the art, high-security code and firewall. Our co-location center, n|Frame, located just north of Indianapolis, is owned by one of the nation’s largest media companies. The facility also provides services to companies like Monster.com, Rolls Royce and pharmaceutical giant Eli Lilly. The center has biometric security, redundant internet connections, redundant power feeds, redundant uninterruptible power supplies, redundant air handling to keep everything nice and cool, and is manned 24 hours a day, 365 days a year. At 1up!, our mission is simple: we understand the unique needs of small to medium-size online publishers and strive to produce efficient, highly cost-effective and intuitive online solutions for them. When it comes to helping you build a successful website, we believe that our staff is as important as our product. To help acquaint you with our company and our philosophy, we've provided a little background information about the folks who head up the 1up! departments. We're a small company of professionals who are driven to provide you with the quality products and services you need to power your website. After so many years in the business, we think we've put together a great crew! David, aka "Dave," "Mac," or "The Big Cheese," is a founder of 1up!. He runs the place. When David isn't running the place...hmmm. When David manages to sneak away from the office, he spends time with his daughter doing fun things like riding horses, camping, star watching and kayaking. As a former photojournalist, Dave still dabbles in digital photography. Everything that has anything to do with our software or hardware falls into the capable hands of Christian, who heads the highly skilled 1up! team of programmers and network administrators. In other words, he's the (second) most important guy in the building. Although his hands are full with developing new products, maintaining the existing ones and making sure your site is served 24/7, Christian still has time for a little bit of fun. He's an avid baseball fan and actually likes running marathons (he ran the 2014 Boston Marathon, and did quite well! ), but mostly he enjoys being with his wife and daughters. Eric leads the talented 1up! sales and customer service teams. If you have questions about any of our products and services, give him a call or send him a quick email. They'll be happy to discuss your Web strategy and talk about ways to enhance your readers' and advertisers' experience. Eric enjoys motorcycle riding, playing guitar and cheering on the Chicago Cubs. He most enjoys spending time with his wife and two little girls. We're located in beautiful downtown Kokomo. 1up! is a dog-friendly employer. If you are sensitive to pets, please let us know. To reach us by telephone or email, click on the "Knock, knock" link at the top of the page.